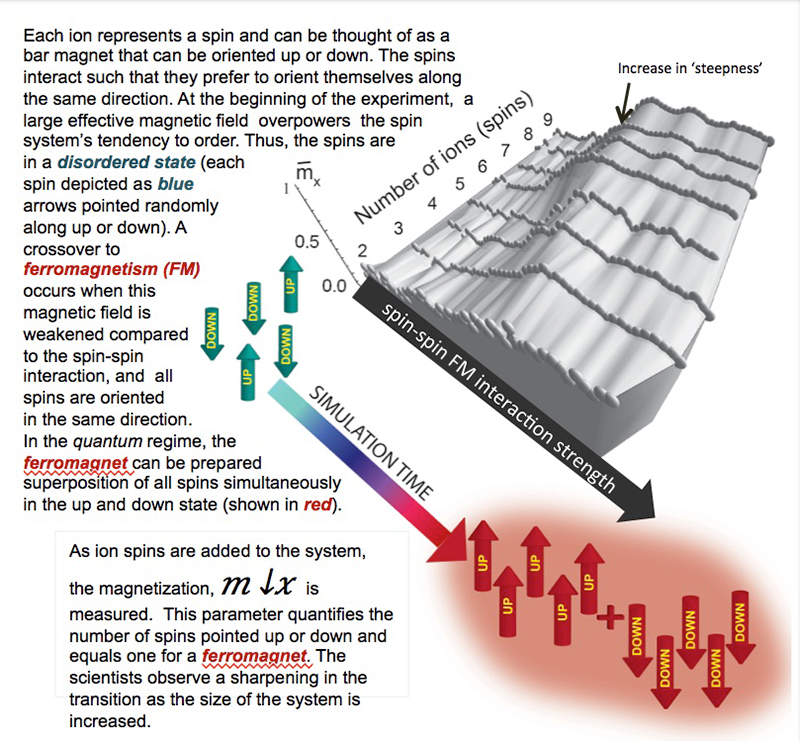 Quantum spin models are powerful because they can describe many types of physical phenomena such as phase transitions in magnets. Simulations of these models can provide insights when the actual system of interest is difficult to understand theoretically or challenging to experimentally probe. Recently, PFC-supported researchers at the JQI have used a small crystal of ion spins to experimentally simulate quantum magnetism. Quantum simulations of this type, that push the limits of current computations have applications in quantum information science. To mimic a model that describes quantum magnetism, known as the transverse field Ising model, the researchers shine different colors of laser light onto an ion crystal. They choose specific colors to create spin-spin interactions that are analogous to that of a quantum ferromagnet. The scientists build up the simulator, one spin at a time, allowing them to explore finite-size effects, such as how the transition to ferromagnetism sharpens with each additional particle.